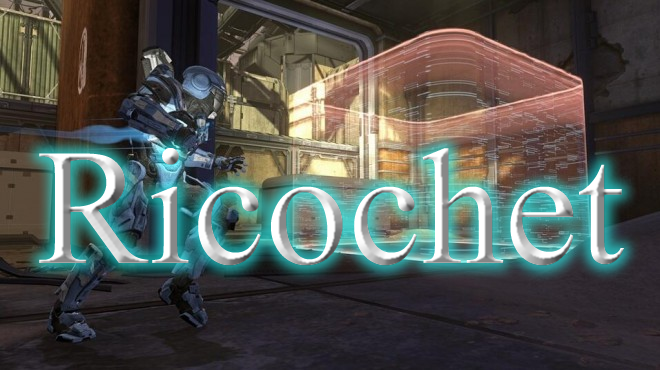 With the release of the v2 gametypes (download here), Ricochet is now a gametype up for selection! It's pretty similar to the standard matchmaking variant, with a few specific adjustments. The spawn delay for the ball is by default 10 seconds, and it was reduced to 5 seconds. This gives a slight edge to those who already know the ball's next spawn position, but still lets everyone know where it's about to spawn. Also, Ricochet will be available for both regular and Heavy maps! For regular maps, it's just like usual, but for Heavy there's just a single small twist: there are two goals. Since a single goal would be too easily defended, there are two nearby goals which you can score the ball in. Below you can find pictures of the locations for the two maps this week: Meltdown and Two (both on my fileshare for download). The purpose of the two goals is just to give you a closer target if you decide to charge from another direction. For instance on Meltdown, initially I had a single goal on the bridge, but it was effectively worthless to charge from the bunker side of the base, so the secondary goal makes that more viable now. Executive & H. Executive: Removed the King's permanent 1.5 OS, but increased shield regeneration from 75% to 90%. King can now use any armor ability. H. Asset: Ball count is now 2. No other changes made. H. Lockdown: Basically, Dominion is back, but toned down. No turrets, and resupply only gives an OS. Resupply slowed to every 90 seconds. The Executive change was something that was supposed to be done at the start of the war, but I forgot about it until recently... So yeah. The H. Asset change should make the gametype more suited for larger numbers of players. The balls still explode every 60 seconds, but there are two of them now, so this should (hopefully) force more map movement and less camping in your base. The H. Lockdown change is similar to the above. It'll cause more map movement and allow for better opportunities for comebacks. Also, be aware, that for Meltdown they are not at the default locations; they are located between the snipers and the side caves. This is still named Lockdown, so all bases are in somewhat contestable locations. PS: If you've already managed to take a look at Two, you'll notice that I changed a good amount. The map still needs significant testing and fine-tuning, so it may be further adjusted before Sunday.